It seems the more information we get on how to calculate ovulation day, the more we just get confused. There are many things to consider, including whether or not you are “regular” (so many now are not! ), and so your own personal ovulation date usually proves to be elusive for most of us. When I calculate my ovulation date, more often than not the method I use will be just slightly different from the one you use when you calculate your ovulation time, but will just as often result in completely different answers. Simply put, this is the time in between your periods when your body releases an egg for fertilization. This is the time you will want to try for a baby. On the other hand, if you are avoiding conception, these are precisely the dates you should avoid. The simplest way to manually calculate ovulation period is to count backwards 14 days from the date your next period will start. That will be the date of ovulation, and you will be most fertile in the few days nearest that date. This is easy enough for those with regular 28-day cycles, but those with longer, shorter, or otherwise irregular cycles will find out that their ovulation will be later or earlier in the cycle. 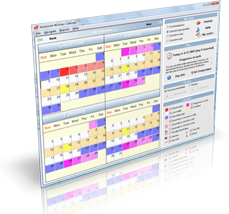 If you really want to know your ovulation period with the least amount of guesswork and more complete information without breaking out in sweat with the sheer mathematics of it, you can simply use widely available programs like Advanced Woman Calendar (http://www.eovulation.com/). 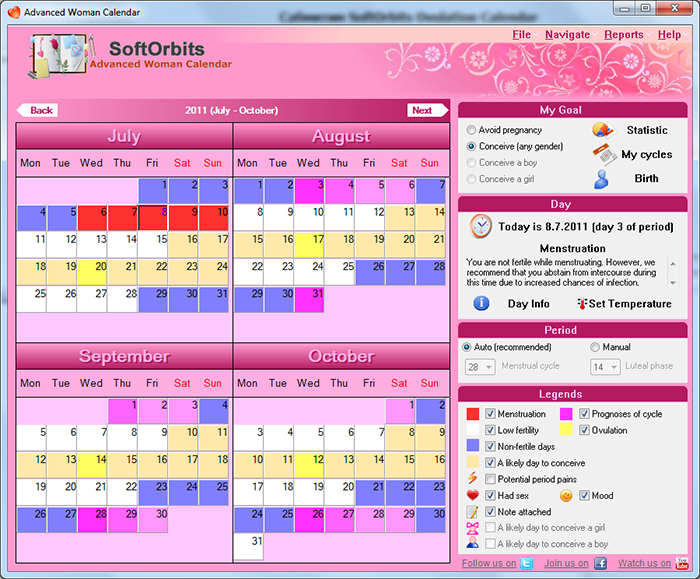 Made by award-winning software group SoftOrbits, this program simply inputs the date of the first day of your last 3 periods and comes out with the most precise dates of the different stages of your fertility, as well as when you should be trying for a boy or a girl, and even the target birth date of your baby should you conceive during this cycle. God bless the Internet!